In our modern world, our refrigerator is an item most of us can’t live without. By calling Appliance Force, you can be guaranteed that our expert technicians will have your fridge or freezer back to normal working order quickly and affordably. Our technicians are professional, extremely courteous and most of all effective. We provide the best appliance service in the Calgary area. 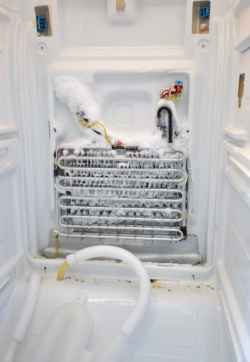 If you are experiencing any of these issues, give Appliance Force a call at 403-770-9793 or book online and we will get our refrigerator service specialists out as soon as possible. Please bear in mind that if your fridge or freezer is not working at all, you may need to throw out your food. Food can go bad within two hours and can cause food poisoning. Our highly-trained technicians have the expertise to know what to look for when diagnosing your fridge or freezer. We will look for frost patterns, type of ice build-up, condensation and/or water dripping to help pinpoint the source of the problem. Issues can range from problems with compressor or motor to ineffective seals or sensors. Our professional appliance technicians are specially trained to work with various gas compressors. We will provide you with a full diagnostic quote that will allow you to make an informed decision about repair. Make sure the power is working properly by flipping the breaker off for 15 minutes and then back on to reset it. Replace the water filter. Most filters can be purchased online or Appliance Force would be happy to assist you with a part order. Clean the condenser coils. Remove the kick plate at the bottom of your fridge and clean the coil with your regular vacuum. Reset your fridge. Read your manual for instructions. If your issue isn’t fixed by any of the above, give Appliance Force a call and we will send one of our professionals. Please have your model and serial number handy so that we may quickly process your appliance service. Our technicians are factory trained on all major refrigerator and freezer brands, so that no matter what make or model, you can be confident we will get the repair completed properly. We service Kenmore, Viking, Bosch, Kenmore, Whirlpool, GE and Maytag and many others. Our appliance service trucks have the all major parts stocked, ensuing that your fridge repair can go seamlessly. For your Calgary and area fridge repair, Appliance Force is your number one choice for prompt, professional and expert service.